Baseball legend Babe Ruth was one of America’s greatest sporting stars, breaking all manner of batting records during a 22-year career. And he was equally formidable when it came to his off-field appetites, as Iain Russell discovers. 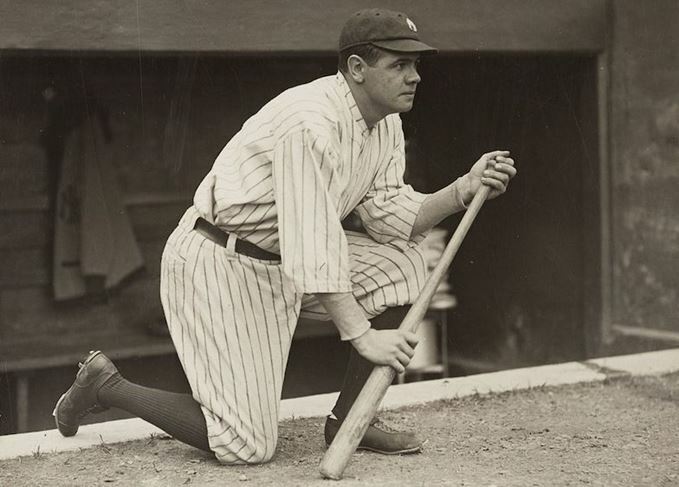 George Herman ‘Babe’ Ruth Jr (1895-1948) is an all-American hero, considered by many to be the greatest baseball player of all time. He played Major League Baseball (MLB) for 22 seasons between 1914 and 1935, winning seven World Series titles, hitting 714 home runs and building a career OPS (on-base plus slugging percentage) which has never been equalled. A huge and hyperactive man, he also showed a voracious appetite for food, drink and sexual shenanigans – sometimes indulging in all three simultaneously. Ruth was a wild child who began drinking beer and chewing tobacco before he reached his teens. He was sent to a reformatory, where he was declared to be ‘incorrigible’ and exhibited classic signs of what is known today as Attention Deficit Hyperactivity Disorder (ADHD). He was encouraged to channel his energy into baseball, and was discovered to have a prodigious talent. After starring for teams in Baltimore, he began his MLB career with the Boston Red Sox in 1914, as a talented left-handed pitcher. He won two World Series with the club. In 1920, Ruth moved to the New York Yankees and was allowed to switch from the mound to his preferred position, as a big-hitting outfielder. He began breaking batting records and swatting home runs galore, drawing huge crowds to ballparks across the country. His on- and off-field exploits became the stuff of legend. Part of the off-field legend revolved around his drinking. Ruth’s mother was reputedly an alcoholic and his father, a saloon owner, was killed in a drunken brawl in 1918. This didn’t discourage The Big Bam, who was an enthusiastic beer drinker in his younger days and soon discovered the delights of other beverages, including Scotch whisky. The introduction of Prohibition in 1920 had little effect on his drinking habits: when you were as famous and wealthy as Babe Ruth, you could get booze any time and any place you wanted it. Another biographer, Leigh Montville, tells the story of a reporter who was summoned to Ruth’s hotel room late one night before a game. Ruth poured him a large whisky. The reporter questioned the wisdom of drinking so close to the game. Stories of Ruth’s excessive appetites for food and drink are legion, leading Montville to claim (tongue-in-cheek) that ‘beer and Scotch and hot dogs were his nutritional supplement of choice’. Did he really order a quart of whisky and ginger ale to wash down his breakfast? Did he really wolf down 24 hot dogs between games during a double-header? That’s what appeared in the papers, and the legend kept growing. While modern athletes might rest up between games, Ruth preferred to spend his time more energetically – in the company of female fans who visited his hotel, or at the local brothel. In 1925, a private detective, hired by the Yankees to tail their star player, reported that Ruth slept with six women during just one night out in Chicago. Once, travelling with the team, he was chased through the train by a knife-wielding woman with a grudge. Another time, he fled near-naked from a man who came after him with a gun, after discovering that Ruth had slept with his wife. When he wasn’t eating, drinking, consorting with ladies who were not his wife, or playing baseball, Ruth played golf. He often took his clubs on the road, and he attracted huge crowds when he played in exhibition matches. Cynics say that he loved golf because he could eat and drink while he played. His daughter claimed that, after he retired from baseball, golf became his only real interest. She remembered he would go to his club each day and drink two or three Scotches with his lunch before setting off for a round. Then a few more Scotches at the turn. And then celebrate a decent score afterwards with… a Scotch. In 1935, Ruth left New York to join the Boston Braves, but his best days were far behind him. He retired to live with his second wife in an 11-room apartment in Manhattan. Supplies of Scotch were sent up from the local liquor store, and the delivery boy recalls that Ruth always tipped him well. Not that Ruth needed to pay for a drink.